In 2009, I was walking along Sago Lane in Chinatown and came across a shop selling bamboo strips, the type of old non-paper books used in ancient China. The shopkeeper told me, 'Take a look, young man'. The book has a title 三十六计, which means 36 Stratagems. To verify that this is the right book that people talked about, I asked her, 'Where is 'Escape is the best'?'. She said, 'at the end'. She explained that escape is always the last resort, not the first thing to do when a problem arises. Indeed I was escaping from a problem at that time. I could not come up with an interesting topic for my lecture to CPA Australia, and I was thinking of turning down that speaking engagement. With that lesson from her, I bought that bamboo strip book, used it for my speech at CPA Australia dinner, and it was a roaring success. 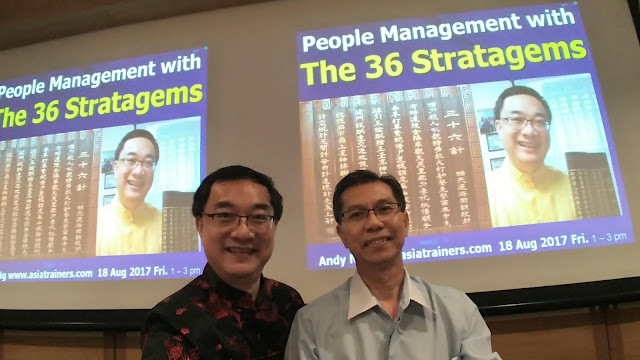 From then on I have been studying and researching this topic 36 Stratagems. The Stratagems have given me tools and ways to solve my business problems, get more business and be ahead of others.